This past summer, the Toronto music community suffered a loss when Smoke Dawg was violently killed in the downtown core; that didn't stopped his team from finishing the album that he was working on prior to his passing. The result? 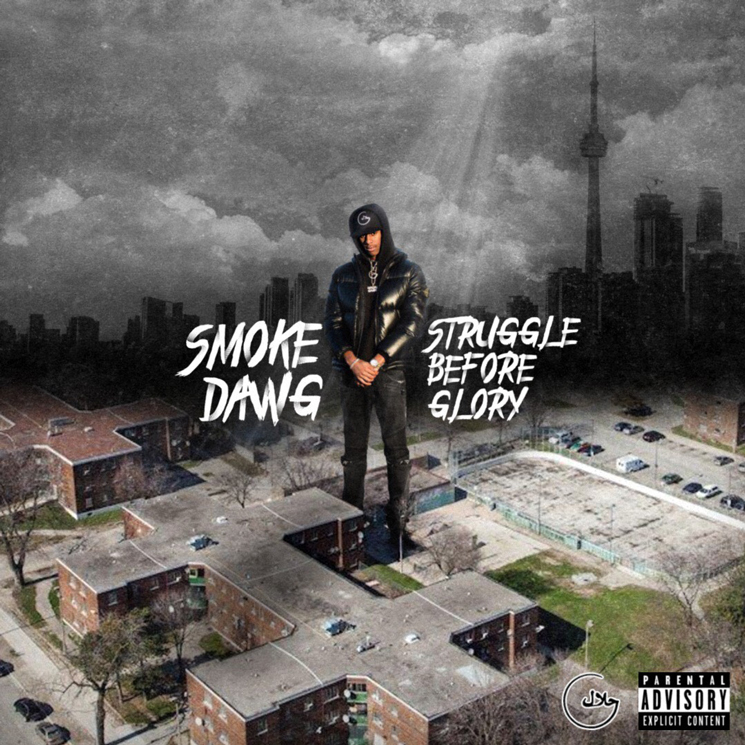 Struggle Before Glory, a 13-track album that tells the story of Smoke Dawg, from his Regent Park roots to his OVO affiliations. Boasting features from the likes of Toronto artists Puffy L'z, Jimmy Prime, Jay Whiss and Safe, as well as UK artists Fredo, AJ Tracey ("No Discussion") and Giggs ("Bricks"), Struggle Before Glory ties together Smoke Dawg's two worlds: the grime of the city and the glory of success. Despite one common denominator between those two worlds being jealousy, Smoke Dawg stays in sync with his own crew, first and foremost. While Struggle Before Glory's ominous production, largely at the hands of Murda Beatz, lays the foundation for Smoke Dawg to speak about illicit activity — a running theme throughout the album ("Automatic," "Fountain," "That's A Lot"), the Pro Logic-produced "YND" adds a softer dimension to Smoke Dawg's discography otherwise rarely heard, and subsequently tip-toes into an romantic relationships. In a similar fashion, the upbeat dance track "These Games," which features Jay Whiss and Safe, glimpses into a lighthearted future over a bouncy dance beat. Ultimately, it's representative of the glory after the struggle, and the final chapter of a career cut too short. But perhaps the album's bonus track, "Smokey World," which features Young Smoke, sums up the late rapper's legacy: straightforward rhymes with melodic cadences, but more importantly, an unapologetic loyalty to those who were with him in through the Struggle Before Glory.